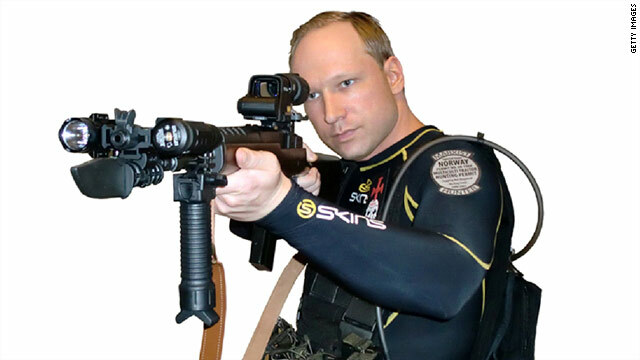 Anders Breivik's purported manifesto says he planned every detail of his rampage, down to this photo being released to media. Survivor on Utoya Island recalls shooter screaming, "You're all going to die!" (CNN) -- Anders Behring Breivik, to hear his purported manifesto tell it, was nothing if not patient. Though the world didn't know of Breivik until Friday's attacks, his road to violence began in his teens, when he first started honing his abhorrence for Islam. The 32-year-old Norwegian waited years before setting off on his vicious, self-confessed rampage last week that killed eight in a bombing in central Oslo and left dozens more dead at a nearby island youth camp. He bought a farm as a front to procure fertilizer for bombs and planned other details meticulously, down to the photos of himself he wanted distributed among media outlets after his arrest, he wrote. It's now been revealed that parts of his 1,518-page egomaniacal treatise were lifted from right-wing blogs and a similar manifesto by Unabomber Ted Kaczynski, but the document paints the frightening picture of a man driven to violence by the "colonization" of Norway by a religion that actually makes up only about 3% of its population. In the manifesto, he wrote of joining Knights Templar Europe, a revolutionary group he lauded for its "crusader nationalism," in 2002 after becoming disenchanted with Norway's conservative Progress Party. He blamed the media for vilifying his party and denounced democracy as an institution. "Armed struggle appears futile at this point," he wrote, "but it is the only way forward." Breivik appears to have begun fostering a hatred for Muslims at an early age, according the manifesto, titled "2083: A European Declaration of Independence." CNN could not independently verify that Breivik wrote the document, and Norwegian authorities would not confirm that the man in their custody wrote the manifesto. The document, which has been widely distributed online since last week's massacre, begins with a title page attributing it to "Andrew Berwick, London -- 2011." Later, in an explanation of his interest in genealogy, he traces the origins of the names Anders, Behring and Breivik. Breivik joined Oslo's hip-hop movement at age 12 and by 15 was the most active graffiti artist in the Norwegian capital, he wrote. He had Muslim friends and hung out with violent Pakistani street gangs, which he said was essential to the safety of Norwegian teens in Oslo. "Unless you had Muslim contacts you could easily be subject to harassment, beatings and robbery. Our alliances with the Muslim gangs were strictly seen as a necessity for us, at least for me," the manifesto states. Breivik wrote that he left the hip-hop community when he was 16, the same year he was attacked by "an older and much stronger/bigger Pakistani," one in a series of assaults Breivik said he suffered at the hands of Muslim youth. After this incident, he ended his friendship with a Pakistani named Arsalan, and he and his Norwegian pals no longer enjoyed the protection of Muslim street gangs. "From now on we would have to arm ourselves whenever we went to parties in case Muslim gangs showed up," he wrote. Despite staying in his own west Oslo neighborhood, Breivik was attacked or confronted at least once annually until he was 21, he wrote. He alleges most of the assaults were unprovoked, though he concedes he "contributed" to one of the incidents when he was 20 by uttering profanities at a girl who pushed him and called him a name at Burger King. Though he suffered a broken nose in a fight with a Pakistani gang when he was 18, he boasts he was able to outsmart or negotiate with the Muslim "savages" in most cases. Fighting with them, he wrote, was not his policy "under normal circumstances." "As all my friends can attest to I wouldn't be willing to hurt a fly and I have never used violence against others," he wrote. "If we wanted to we could have harassed and beaten up dozens of Muslim youth. However, as we didn't share their savage mentality, violence was pointless." Breivik, it seems, does not fit in a tidy compartment. He is a man of contradictions. A product of what he calls a "privileged upbringing," he describes himself as optimistic yet pragmatic, and as a "cultural conservative" with liberal economic views. His diatribes against Islam and calls for violence are littered with winky-face emoticons and playful Internet lingo like "lol." Is Christian a good label for Breivik? His manifesto includes an image of him in preppy dress, a collar popped over the neck of his sweater. In other photos, he sports a variety of dress: a sensible suit, a hazmat outfit, elaborate military regalia and a frogman's jumpsuit with a shoulder patch that reads, "Marxist Hunter." He also claims to be a moderately religious Protestant who would like to see the denomination absorbed by Catholicism. This paradox, perhaps, is nothing compared to his claim of being Christian while confessing to having disregarded the Bible's least debatable commandment. Breivik's massacre, according to police, began about 3:20 p.m. Friday -- less than three hours after Breivik concluded his online treatise, saying, "I believe this will be my last entry. It is now Fri July 22nd, 12.51." The week was winding down in Oslo, and many people were heading home for the weekend, said journalist Asgeir Ueland. "All of a sudden, I heard a massive explosion and saw a massive cloud of smoke coming from the streets," he said. "Of course, this has never happened in Norway before, so I think people were mostly in panic and didn't really know what happened." Video and photos from the scene show the blast shattered windows on all six floors of a building housing the Petroleum and Energy Ministry. Across the street, the bomb's shrapnel almost reached the top offices of the 17-story government headquarters where Prime Minister Jens Stoltenberg's office is located. Mona Dundeberg was on the fourth floor of a building a block away. "We ran up to the building and saw everything was shattered," she said, describing the scene as "just chaos." A young woman told a local television station, "We suddenly felt a barrage of glass hit us from behind. We were then told to run through the back door. That's when we saw everything was blown up. People said there were bombs around. I didn't really know what's going on." If the manifesto attributed to Breivik is a blueprint, he took great pains to ensure his bomb had maximum impact -- and he left what appear to be instructions to like-minded saboteurs. Who are the Norway victims? Several pages of the document outline a plan to buy various chemicals and more than a ton of nitrogen fertilizer for bombmaking. Breivik tells his would-be followers to create a company, preferably a year or two before ordering the fertilizer, and to join an organization of small- to medium-sized farmers. He suggests learning how to distribute the fertilizer and use the chemicals legitimately in case the agricultural supplier poses "security questions." He also suggests buying seeds for an imaginary crop and, in addition to two 1,100-pound bags of nitrogen fertilizer, purchasing one or two "dummy bags" of non-nitrogen fertilizer to "strengthen the credibility of the transaction as it will act in your favor when it comes to avoiding suspicion." "I haven't actually used this method yet, myself, but this is the approach I will select shortly," he wrote. "I guess you will soon find out if I succeed or not. Remember, confidence separates the winners from the losers, so good luck." According to his lawyer and police, Breivik wasn't done after his bomb ripped through the Grubbegata, the avenue housing the government quarter in central Oslo. He traveled to Utoya Island and, about 90 minutes after the blast, began shooting at campers attending a youth camp organized by the Labor Party, one of many sources of Breivik's angst. A hospital chief surgeon said he had never seen wounds like those suffered by the victims and speculated that Breivik may have used expanding bullets, according to a hospital spokesman. The manifesto has links to several websites containing instructions on how to make custom bullets. Breivik also includes instructions on how to load bullets with chemical/biological agents (such as ricin, pure nicotine or globefish toxin) and what to do if hollow-point ammunition is banned in your country. Witnesses say Breivik was wearing a police uniform when he arrived at a meeting room where hundreds of campers had gathered for a briefing on the Oslo bombing. Many of the youngsters said they thought Breivik was there to discuss the Oslo blast. Instead, he opened fire. About 700 teens and young adults had converged Wednesday on Utoya island for the youth camp, which was slated to end Sunday. It's an idyllic setting on the inland lake Tyrifjorden, one the prime minister has called a "paradise of my youth." Stoltenberg had been scheduled to deliver a speech at Utoya the day after the shooting. Many of the campers had pitched tents on the 26-acre island, and after Breivik opened fire in the meeting hall about 5 p.m., the campers scattered, some back to their tent village, others to the waterline. Witnesses said Breivik shot people who took refuge in their tents before making his way to the shore. Survivor Otzar Fagerheim said Breivik had three guns and shot them calmly, as if he were taking photographs. He smiled at times, Fagerheim said. Another survivor, Adrian Pracon, recalled his friends and counterparts dropping one by one as he ran down a hill to the water. "You're all going to die!" he remembered the shooter screaming. Kasper Ilaug was at his summer home on Storoya Island, less than 2 miles away, when he received a call about the shootings. He jumped in his 18-foot fishing boat and headed to the island. "The first thing I noticed that (there) was a lot of youngsters laying in the shore, and they were very calm. They were sitting in groups," he said. On the shore, he saw 10 dead, he said. Later, he saw three more people behind a rock. They, too, may have been dead, he concluded, because they didn't respond when he called out to them. He took three boatloads of campers -- more than 20 in all -- back to the mainland. Many of them were in bathing suits or half-dressed, in shock and shivering from being immersed in the 64-degree lake. One of the girls asked Ilaug if he was a police officer and was relieved when he said no. I haven't actually used this method yet, myself, but this is the approach I will select shortly. It's unclear how Ilaug, one of at least two boaters who reportedly ferried youngsters in the water back to the mainland, was able to make multiple trips to the island without being shot himself. Back on the island, police began arriving shortly before 6:30 p.m., but the young people were unsure what to make of them and pleaded with them to put down their weapons. Norwegian authorities have come under heavy criticism for their response. People on Utoya Island who called police told local media they were ordered to stay off the emergency services line unless their call was about the Oslo bombing. There have also been reports that an overloaded police boat had to turn back after it sprung a leak crossing Lake Tyrifjorden and that the Oslo police's helicopter crew was on vacation and couldn't be mobilized to respond. Oslo Police Chief Johan Fredriksen addressed the helicopter allegation during a Tuesday news conference, saying the issue had been "blown completely out of proportion" and explaining the chopper's availability was related to weather conditions and personnel. "We are professionals, but we are only flesh and blood," Fredriksen said, according to The Wall Street Journal, adding that he welcomed scrutiny but "it's not the time for people to bring politics and issues of resource allocation into a situation like this." An elite police unit finally took Breivik into custody about 6:27 p.m.
Attorney Geir Lippestad told a television station that his client would explain himself at a Monday hearing, but a judge ordered the proceeding closed for security reasons and also so it wouldn't impede the investigation, a court spokeswoman said. Judge Kim Heger also denied Breivik's request to wear a uniform to court. In solitary confinement, Breivik has been allowed to see only his lawyer, who said Monday that his client felt the killings were "horrible" but necessary. On Tuesday, Lippestad further said his client "may be" insane. He added that Breivik was a "little bit surprised" he was able to kill 76 people but felt his plan had "succeeded -- succeeded in his mind." CNN's Tom Watkins, Michael Holmes, Moni Basu and wire staff contributed to this report. Colleen McEdwards talks to security expert Anthony Roman about security issues surrounding the Norway terror attack. A Norwegian mom explains how she helped keep her daughter calm throughout the hour-long gun rampage at Utoya island. The father of Norwegian terror suspect Andres Breivik says his son is mentally ill and should have killed himself. Britain's prime minister calls for urgent review of far-right groups following deadly attacks in Norway. CNN's Anderson Cooper reports on the possible motivations of the suspect in the Norwegian terror attacks. Thousands of grieving Norwegians took part in a march and a minute of silence to honor the victims of the Oslo and Utoya attacks. Norwegian Prime Minister Jens Stoltenberg talks to Nic Robertson days after a bombing and shooting rampage in Norway. For Norwegians still in shock from Friday's horrific attacks, there is a sense they have woken up in a country that has "lost its innocence."